Jupiter represents prosperity, positivity, balance, learning, finance, and good luck. You like to research the various problems of the world and try to figure out solutions. You enjoy thinking outside the box to come up with ideas that no one else has thought of, and discuss these theories with your social network to determine their merit. You love a good debate and encourage people to play devil’s advocate. This is why you cast a wide net for friends and are very accepting of people from all walks of life. You never know what kind of viewpoint or opinions people bring to the table until you let them through the door. You also look for people who are influential or can put your ideas to good use. (Read more articles on Aquarius sun sign). People with Jupiter in the eleventh house in astrology, put their good will toward humanitarian efforts and have grandiose plans to advance knowledge and technology. Progress is very important to you, and you are open to trying anything new. People recognize your tolerant nature and are usually quick to get on board with your ideas because of it. They appreciate your acceptance of new theories and enjoy working with someone with such an open mind. (Try this free planet in houses calculator). But the only thing that will bring you true spiritual growth and fulfillment is the ability to work on what you want when you want, and that can be difficult. Finding a career in education is a good path, for it allows you to research projects and share ideas with those who have a similar interest. The only thing that confuses people sometimes is your unorthodox methods of research. While makes sense to you, others question your unique sense of organization. But because your mind is so full of thoughts you have your own way of looking at things that separate one idea from another. Other jobs that give you more freedom in your schedule will also work better, for you hate maintaining a routine. Anything that becomes repetitious is boring to the person born with Jupiter in the 11th house. 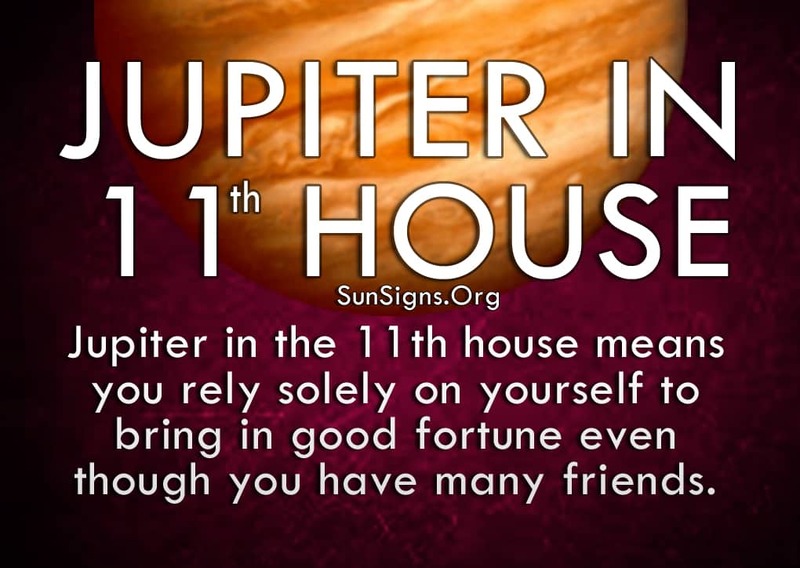 People with Jupiter in the 11th house need to retain their independence from monotonous work. But sometimes you have no choice and you have to deal with the mundane details of life. Those closest to you know this is the only way you can work, so they leave you to your own devices. And once others see the results you get, they too will allow you to work in whatever way you need to. As long as you continue to bring in good fortune, people will continue to support your quirky habits. Your sense of community and resourcefulness takes you a long way in their eyes. When that happens, try to employ help from your loved ones to bring some order to the chaos that tends to be your life. While you think that kind of noise is necessary to get further in your process, it isn’t. Sometimes you simply need to clear your mind to get where you want to go. Trust in their expertise as they trust in yours, and you will form even greater partnerships.